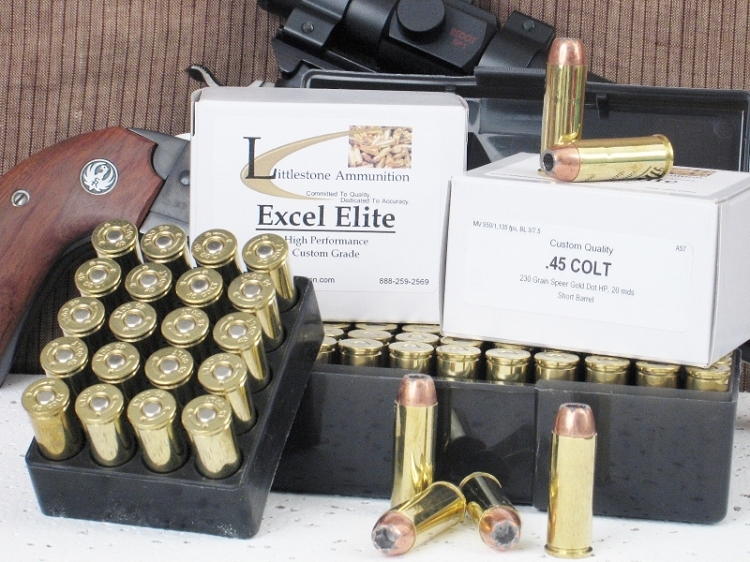 Load the power of Littlestone Ammunition for self-reliant confidence in your .44 Remington Magnum revolver. These 50 rounds of custom-quality Littlestone Ammunition launch a 240-grain Speer Gold Dot Deep Curl bullet at a muzzle velocity of 1,420 fps and it packs 1,075 ft lbs of energy. The bonding process virtually eliminates the possibility of jacket/core separation. The hollow point versions are manufactured in three steps. First the core receives the bonded jacket; next an oversize hollow point cavity is installed with predetermined expansion folds; and lastly the final cavity shape and volume are set for the optimum performance for the cartridge and intended use. It typically retains about 95% of its weight through impact. This particular loading is highly effective on light to medium game, and performs well as a personal defense load as well.